SOAS prides itself on endeavouring to be a place in which the many cultural, social and intellectual currents of the world can safely and creatively intermingle in the lives and minds of its students and staff. In Radhanath Swami’s spellbinding talk we were given an insight into just how one man’s life can represent the fulfilment of SOAS’s aspiration. His Holiness Radhanath Swami has plumbed the depths and imbued the riches of many of those currents. He has studied the New Testament in Assisi, the Qur’an in Iran, the teachings of the Buddha and the Vedic scriptures in India. He is a living witness to the possibility that these streams of wisdom can irrigate the soul without the de-stabilising turbulence of violent cross currents. In His Holiness showed in the narrative of his formative years how respect and integrity can channel these historic sources of wisdom into a confluence that is not a collision. But this was no romantic cheap universalism; his message showed that mental toughness, personal character and the active cultivation of virtue demand a person’s will to be engaged; all to prosper and be brought to their appointed fulfilment under the gentle, loving tutoring of God’s grace. The final image that accompanied the audience as it dissolved into the autumn evening was that of His Holiness scattering the ashes of his Jewish mother on the waters of the Ganges: the mother that gave him physical life merging with the mother of his spiritual nurture. 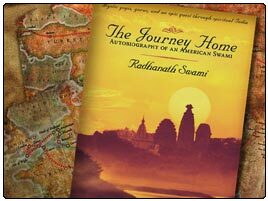 All who were touched by the narrative of Radhanath Swami’s life, encapsulated in that image, left to contemplate their own journey through life; their own narrative of salvation.